Re: Anyone Collect Mondo/Art Prints? Now that NYCC has come and gone, Grey Matter Art will be releasing Part 1 of our leftover exclusives. We can't thank everyone enough who came by the booth and supported us this year. We had such a great turnout, so thank you to the fans/collectors that made it possible, you're all great! And a big shout out to all of the artist's who worked with us and also came to do signings. 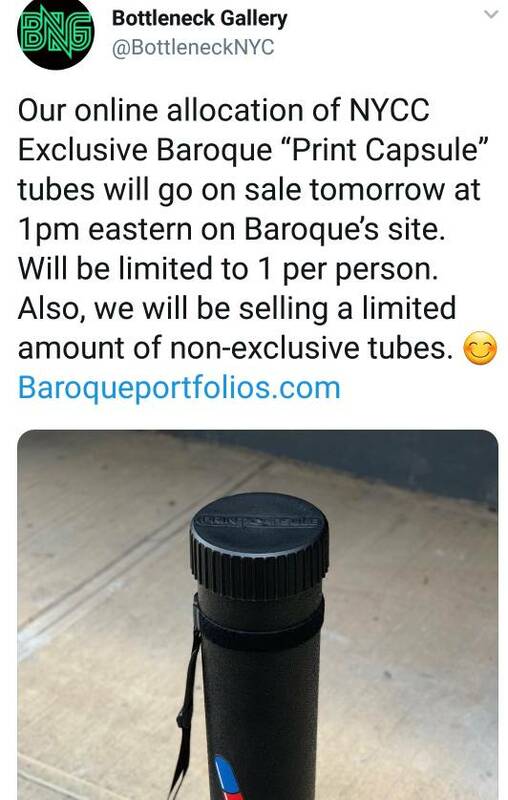 Part 1 exclusives will be released on Thursday, October 11th at 1PM est. on the GMA Website. Below is a detailed list of the exclusives we will be releasing. On Sale Thursday, October 11th at 1PM est. Don't forget, Mondo's MCU Show opens this Friday the 12th! I can't wait! Now that I've moved to the area, I can go. I plan on going opening night. 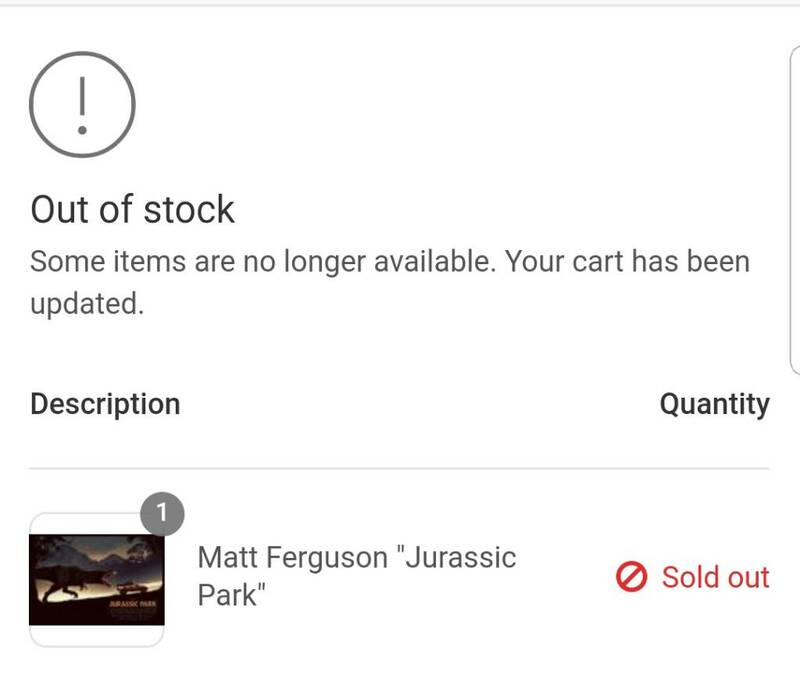 I'm sure that people are there camping out for it right now. JP, SW, Halloween II, Predator 2-variant Beetlejuice, Super Secret Fun Club vinyl sold out. Halloween II and JP, regular and variants, sold out. JP prints were available for a few minutes though. 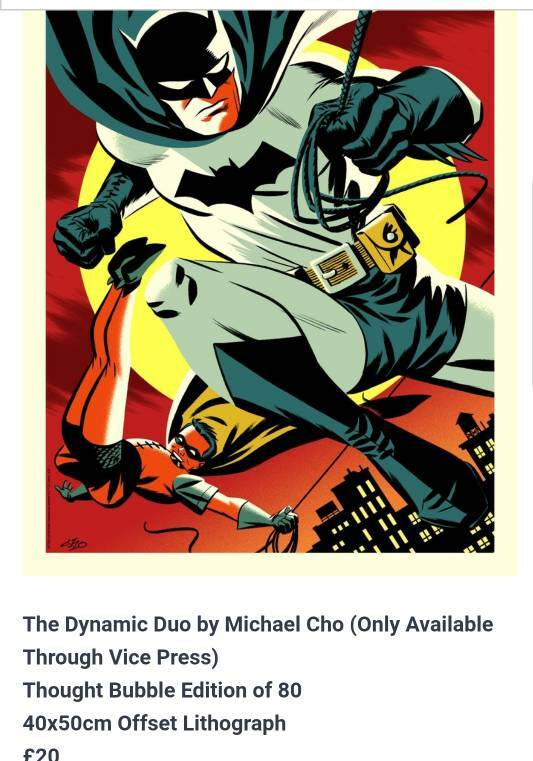 Cho Batman still available. edit: and it is a ton of stuff. It is! I was looking at it earlier today on my phone and just gave up after a while. I like how, for some posters, they have different sizes. 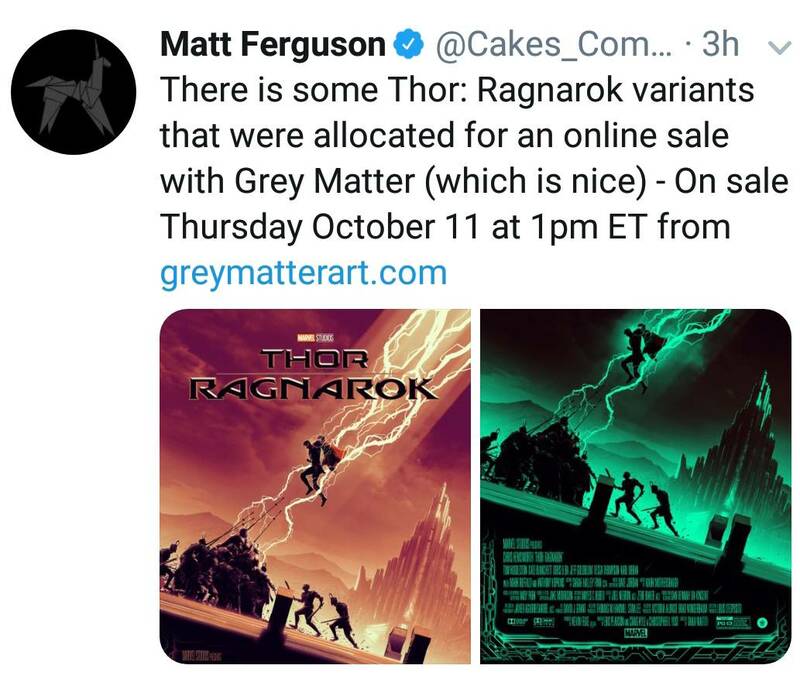 Grabbed the Ragnarok variant from Grey Matter. They send me an authorization code that I had to enter before completing the purchase which was new. Grey Matter Art will be releasing Part 2 of their NYCC 2018 exclusives, featuring so many great artists, such as Tom Whalen, Doaly, Andy Fairhurst, Dan Mumford, Matt Ferguson, and Juan Esteban Rodriguez! These are leftover from NYCC, so quantity is limited. Posters go on sale Wednesday, October 17th at 1PM est. Below is a detailed list of the exclusives that will be released. Tomorrow we'll have the first round of online releases with posters including CAPTAIN AMERICA: THE FIRST AVENGER by Francesco Francavilla, THE AVENGERS (Regular and Variant) by Amien Juugo, IRON MAN (Regular and Variant) by Chris Koehler, THOR by Becky Cloonan and finally SPIDER-MAN: HOMECOMING by Sara Deck! I wanted that Francaville SO BAD but alas I missed it. I got the Avengers variant & the Iron Man variant. I was able to get my number one target: the Spider-Man: Homecoming poster! I had a chance to get the Avengers (variant) poster as well, but for some reason, it wasn’t doing it for me. Plus, I am waiting for part 2 with Civil War and (maybe) Avengers 3. Anything with Spidey in it, I am focusing on that. But for now, very happy about today’s get! I ended up getting the Spidey poster as well. Was definitely feeling the Ferris Bueller vibe. Only other one I was looking at was Captain America but that was gone quick. I was at the gallery again the second to last day before they show ended, and they weren't sold out of anything at that point so you have a good chance. While the Black Panther posters were on display, they weren't for sale yet due to not getting the licensing on time. I believe the only one that got close to selling out was one of the Doctor Strange poster (can't remember which one).